For 29 years of my life, my father would travel to his home in Tehran on the other side of the world for months, sometimes years at a time. My only way to communicate to him was via the telephone, a mysterious device that seemed to be impossible. While he was there, he would listen to Voice of America on his shortwave radio, and loved radios of all kinds, from a Marantz receiver in the 1970's and to an antique Philco cabinet which he bought in the 1990's. My last big gift to him for Christmas was a Grundig shortwave radio. He loved Christmas. My grandparents also loved the radio, listening to Big Band on AM on their Magnavox during the day, and talk radio at night. My grandfather went to radio school in the Army, and still remembered some basic knowledge of circuits, coils, transformers, and vacuum tubes. He used to tell us the story about how his youngest brother in Iowa, who had a heart weakened by rheumatic fever, was able to go to school by staying at home and using an intercom to the classroom. This was fascinating. One Christmas, my brother and I got battery operated, wired telephones which astounded me. Then I realized that these communication systems could operate independently of the phone company. Over the next several Christmases, we got several pairs of wireless, 9v powered walkie-talkies and transistor radios. I had fantasies of operating my own base station while my brother and his friends would be out in the field on a mission, reporting back to me. My neighbor's father worked for Bell telephone, and always had the latest technology, and he had a fancy set of intercoms that looked like old-style pay phones, that they never used, which I coveted for years. In art class, I had the privilege of illustrating the cover of our school's telephone directory, and curiously, it was my first expression of the BirdCreature . When I was around 13, I rewired our home with modern, modular RJ11 phone jacks, took apart our hard-wired, rotary Bell phone like a Little Man Tate and rewired it with modular plug, and begged my family to order "touch-tone" service, which they did. Our neighbors were so impressed they asked me to rewire their house too, and I did. That was only recently possible due to the antitrust breakup of Bell telephone. Previously, we were not allowed to touch our phone wires, and the phone company owned our phone. Being the hypersystemizer I was, I then had to build my first communication system, spanning to our neighbors two houses down. Shortly thereafter, I began connecting my Commodore64 300 baud modem to the telephone line and programmed my own bulletin board system↗. I began proselytizing the "modem" as critical to every household, using the pseudonym "Modem Man", and years later, finally convinced my friends to use them. At college in 1988, I tried to get a job working at the campus mainframe, but all they would do was hire me to drive a van and deliver paper plots and printouts to the physics building or other areas on campus. They wouldn't let me on their computers, so, at night, I would sit in someone else's dark vacant cubicle listening to the cooling fans, high speed printers, watch the reel-to-reel tapes until the next delivery was requested. The following year, my roommate had moved out, leaving me alone in my dorm room, and I would frequent BBS systems, becoming quite hermitized. Not wanting to sit in the crowded computer labs on campus, I managed to get an 80-column VT-52 emulator to connect to the university IBM 370 mainframe from my Commodore 64, working on my Pascal homework, compiling it via terminal before class. In 1990, I began sending both e-mails and "instant" messages to my friend at a sister university, not realizing I was using the Internet for the first time. When I switched to the field of Communication in 1991, I was critical of the lack of hard science and knowledgeable professors, as most of the Arts department was not as concerned with the technical aspects of communication. I was getting down to the nitty-gritty, frustrated, and when I was 21, I decided to take on my most ambitious project yet, building my second communication system. A couple of years later, I got a job working as a Western Union telegram operator, wearing a headset and receiving phone calls late at night from much of the United States and accurately transcribing them into text, using their phonetic alphabet. Just like in Capra's "It's a Wonderful Life" these telegrams were still delivered all over the world, sometimes on foot. The last telegram sent in the United States was on January 27th, 2006, a sad day. Shortly thereafter, the World Wide Web arrived on the scene and I began working in IT Networking, but at home I was building my own computers and creating proxy servers on "thinnet" ethernet 10 Mb coax so my brother and I could share our meager 14.4 Kbps dial-up connection. And later, I was the administrator of a "distance learning" system for a local college, reminiscent of the story of my grandfather's brother, and learned how to stream audio and video over TCP and UDP. The Internet was now the dominant communication medium, and I learned all about it. The World Wide Web, hypertext in particular, created "associative" connections at the speed of mouse clicks, bringing together all of the knowledge of the world. It was a paradigm shift in the field of communication. It made the world seem small. You start dealing with time and latency. You start dealing with codes, tokens, signs, and symbols. My final college film in 1993 was about memory, and whether memory exists within our minds, or outside of them, like a disembodied entity. In the early 2000's, I begin to see the collective, power of collaboration. Web 2.0. I began to merge my knowledge of mathematics and computation with information and suddenly realized they are one and the same. I had studied linguistics years prior but never made that connection. Time-space trade-offs, relational databases, set-theory, etc. Knowledge is like a quantum superposition, a cloud, that collapses when you move your gaze into it. I began creating visualization tools for my new film. I created my third communication system and radio recorder and understood why the Semantic Web was being studied. There is a higher being growing, an egregore, from our collective communication. It has been here for eons, and will continue to be here, controlling us, like we control the multitude of cells in our own brain, the fractal hierarchy. The OswaldCluster, like its predecessor, ThePhoneSystem, were machines that I made that I could talk to, and they talked back. I could send them text and/or touch-tone commands, and they spoke back in a synthesized voice. It is surprising what levels of humanity or inhumanity you can add to a machine through simple algorithms. So, in essence, my machines were communication machines (like switchboard operators) that I controlled by communicating with them, strangely recursive, which was probably one of the things that drew me to them. In 2013, at the age of 43, I got my amateur radio license for the first time. By 2015, I programmed a rudimentary hand-sent Morse code decoder and built my first PacketRadio interface, and in 2016, I began building my fourth communication system, a fully autonomous, self-contained, solar-powered communication relay that uses satellites and distant spacecraft as inspiration. I also got got my second amateur license that year, and in 2017, I created an improved Morse decoding algorithm, resurrecting the ancient language of those early telegrams. When I was younger, in the late 80's and early 90's, I used to check out copies of QST magazine from the public library, trying to decipher its language, and had dreams of starting my own radio station. 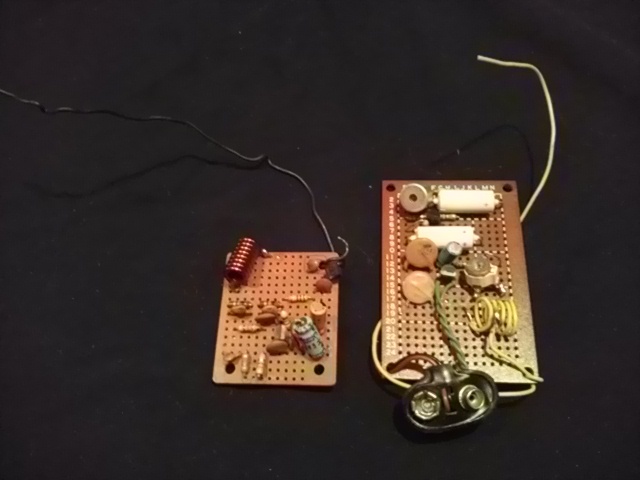 I even tried to build a couple of transmitters (which failed miserably). I started reading about packet radio and thought about getting a license to use it. But this all stopped when I suddenly discovered the Internet which became my focus for the next 2 decades. Prior to the Internet, I used to listen to shortwave radio, but once the Internet formed, I stopped doing that. The Internet killed the BBS, and so I guess I figured it would kill radio communication as well. Since I directed all of my focus into the microcomputer, I never really got to see what it was about radio that the old-timers loved and missed out on the heyday of packet radio. My values were formed in an 80's esque vision of the future, a selfish, dystopian cyberpunk where the most ingenious rules over a cold world, but amateur radio was more "dieselpunk" so to speak. But the more I gazed into their world, the more I realized that radio was the dominant technology of their time, like the microcomputer was the dominant technology of my time, and they were keeping the knowledge of radio free and alive for everyone, just like I try to keep Linux and open-source alive. They are the protectors of the analog wave, the language of the earth and of space. I was a protector of the digital wave, the language of logic, the quanta, the innerspace. But their world is warm, and they are not so much protectors as they are teachers. It is primarily about talking to and helping each other, ingenuity is secondary. It is almost like the old-timers have been there before but managed not to destroy themselves with technology, and now new generations and new technologies have emerged and we need to learn from them before the new technologies destroy us. It is not so much a way of thinking about a particular technology, but a way of thinking about all technology. Perhaps it was the coinciding of the second world war, where the world was truly threatened to be destroyed by technology that gave them this gift. Internet communications are all about encryption and secrecy, but by law, an amateur radio communication must be open for everyone to hear. Wouldn't it be wonderful if we could again return control back to the people and away from the machine? I think we would all agree that mankind's power should be in the minds of people, not in the algorithms of a machine. There is this concept in amateur radio called a "net", and it is not like a digital, computerized network like the modern phone system or the Internet. Amateur radio nets are human-based, and people sitting at their radios act as nodes or relays. And the members of these nets will check in regularly to relay messages. No computers needed. For a while, I wondered why they did that, why they wasted their time, what use it was. And then, a scarier thought hit. What if they didn't do that? What if our computers crashed, such as a widespread power outage or EMP? And what if International Morse Code was forgotten? How would people communicate quickly if simple tapping sounds or flashes of light were the only means available? Because of these nets run by people volunteering their time, and the knowledge they have, there is no technological catastrophe that could bring down human communication for very long. They don't just have the knowledge to restart their net, they can also rebuild the radios (from scratch if needed). And when human communication goes back online, the power of the collective can then rebuild all the rest. Communication is the core of civilization, a phantom of information, an ephemeral, ethereal scaffolding that transmutes into a physical manifestation of human will. My wonderful great aunt, a telephone switchboard operator for most of her life, who kept mailing money and gifts to my dorm room, gave me her old operator chair and headset before she died a few years later. Somehow she thought they would be important to me.